"there's a hum that increases with volume, regardless of what input being used, and its also apparent on the headphone output, so i replaced all the power supply caps. Still present, but at least the caps are now ruled out. - all suggestions appreciated!" Try changing that pair of old green Plessey 2200uf caps on the mixer PSU board, they are 40 years old,and cant be helping much. Those are gone also. I replaced all the 470uf’s (9 of) and the 3 2200uf’s All the old caps were still within 100uf of their stamped value. i should also add, regarding the hum, that i've cleaned up all the earths both on the mixing console and amps, and where possible remade, re crimped etc. i've check for continuity with a meter, and i've also improved the earthing on the mains transformers/transformer screens etc. also tried removing earths systematically with no difference in the hum at all. as stated, also no difference with the unit opened and the mixing console further away from the mains transformers. regarding the decks, i get some additional hum from them, but pretty sure its just atmospheric noise from the MM cartridge in open air, which i think would be acceptable on their own if the overall hum was gone. Theres no additional hum from the decks when you power up the motors, so definately not coming from the deck motors. I'm thinking there must be a component failed/failing or a dry joint somewhere on the common output stages of the mixing console, and when the new pots arrive, i'll spend a bit of time testing/inspecting components in this area. First of all apologies for not responding after you took the time to draw out the schematics, but as you seem to be happily making noise I guess we can move on from that! Regarding the hum, it is probably50Hz earthing. You could check by recording a sample of it and running an FFT using software like Audacity etc, it will show a spectrum peak where the hum frequency is. When it comes to hum it is probably not so much how well your earth points are connected (well it does matter but...). More importantly is how they are connected. You need to avoid earth loops. Entire book chapters have been written about good grounding practicebut the key to it is that you need to avoid loops. There should be a single point of the chassis earthed to the mains, don't connect it at any other point (you'll make a loop). Then wire the grounds in either a star or tree-like structure,, sometimes the star is more logical to people. After the resovoir caps of the PSU is a sensible point. Where a lot of people fall down is the input connectors. Make sure the outer shells are isolated from the metal chassis of the equipment. Wire the inputs with tightly twisted wire to the amp modules, and connect them at one point on the board as close as possible. The ground rail of the board is connected back to your star point post caps. 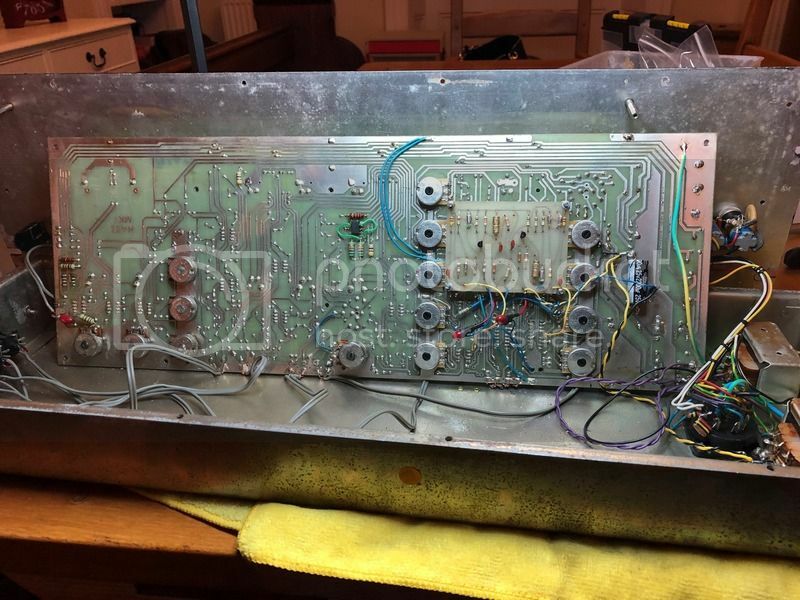 If the outer shell of the phonos is in contact with the equipment chassis, you have a nice big ground loop. If you have long runs of high impedance untwisted wire, you have aerials for 50Hz hum induction. 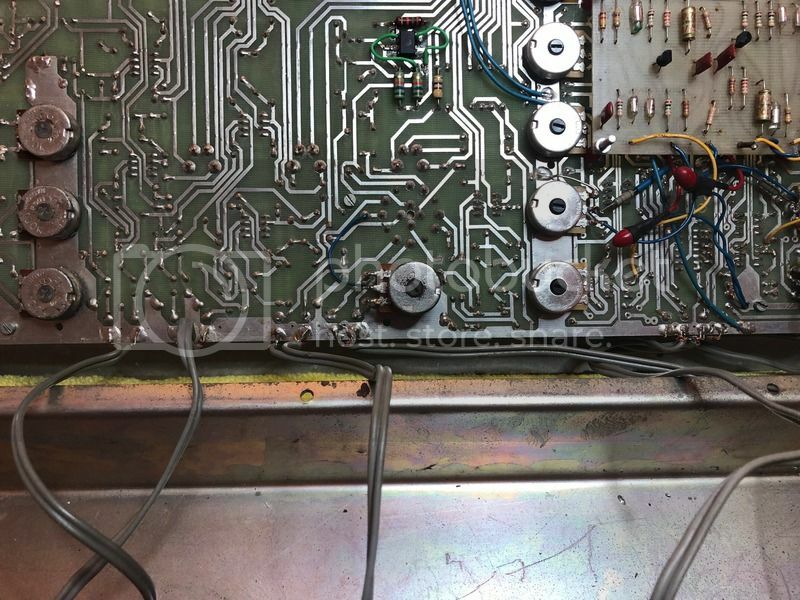 Also check that the pots are isolated from the chassis, and make sure that the decks are well grounded to a single point at the amplifier or phone stage board input, again using nice twisted wire. An electric screwdriver and a vice makes for a very quick and good way of making lengths of twisted wire quickly! Thanks very much to take the time to provide above detail its very much appreciated. I spent today investigating/reworking the grounds, and also last night did a bit further reading on the interweb on the subject. 1, the mixing console outer track would be considered its own ground bus. mixing signal/power all the way round. Advice seems to be that signal +/- should reside together as far as practical (what i have), but ideally should return to the star point. Whats the best here? take all the signal grounds direct from the input/output din plugs straight to the star point and ignore the mixing console PCB altogether? 2, currently the inputs/outputs are wired with single core screen cable. Both screens are connected on the mixing console PCB for each input, however at the din socket, only one is connected and used, the other left open. I'm assuming this is to avoid a ground loop, however i think the open one has the effect of a radio antennal!! So what would be the best type of cable to use for these - a TSP, or the L/R signals twisted and straight to the board, with ground going to the star point? Wolly dependant on the best placement of the grounds. mains hum is greatly reduced, but it does still exist. Isolating the output from the mixing console removes any noise completely - silence. Of course this is just a pair of amps with zero input, however connecting to the console with all volumes at 0 introduces the hum, as does only touching the signal ground (outer case of the din plug) to the mixing console chassis. 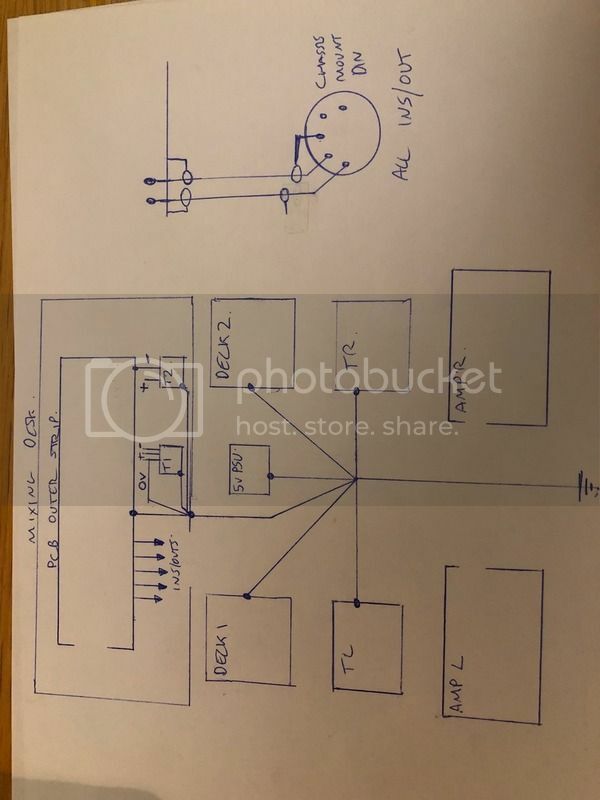 There's definitely a ground loop at play here, and from what i understand, signal ground should be isolated from earth at the amp input, however if you look at my schematics, they are connected directly to the amp ground. Would it be a simple case of removing the amp ground from the input? 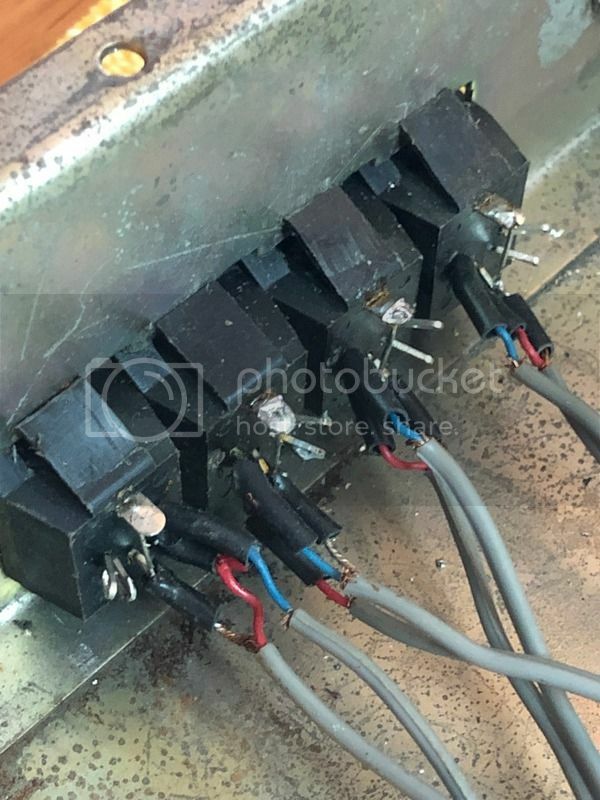 Also noting that i have no safety earth/system ground connected after the amp transformers. the transformer secondary is pretty much isolated, and the amp grounds are all common at the reservoir caps. This may seem a bit daft at this stage of investigation but I can remember vaguely a problem that we had about forty years ago with a Discosound console with a hum problem that was caused by the 12v flexi lights or transformer--I should imagine that you have probably already checked it out but if not, it may be worthwhile isolating that circuit to see if anything changes. Hi, yup, I was well aware that switchmode psu’s Are a no no for audio equipment, but didn’t let that get in the way! All above is mostly with it isolated and off, so definitely not having an effect. further to my last update, i've been continuing to read up on the subject. I now have improved my understanding of where/whjat/why etc, and might have missinterpreted locations, and star points etc, so next time i have the mixing console apart, i think i can make further improvements, which better follow convention, especially regarding safety/power grounds. regarding the signal grounds, i think one of the main drawbacks in this unit is the 5 pin din sockets for the inputs/outputs, and i'm going to change to RCA's, which will allow grounds and sheilds to run continuous and seperate from the PCB signal ground through to the end component without getting commoned in the din plug, and will allow a single signal/ground twisted pair internally. Will also give me the chance to change out the external cabling, which is 40 years old also.